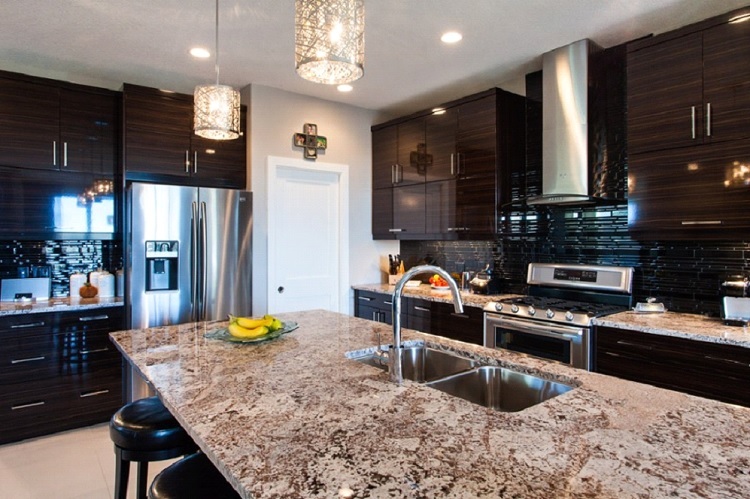 If you’re choosing countertops for your new home, you’ve probably already considered granite countertops in Edmonton. This popular countertop choice is versatile in style, durable, unique and can add value to your kitchen renovation and your home. There is a range regarding the cost of granite in Edmonton. Things that will impact cost include the thickness, colours and veining of the particular slab you choose. On average, granite can cost between $50 and $200 per square foot including installation. Find more information in this article: “Types of Countertops and Prices”. What kind of maintenance will a granite countertop need? You’ll have to seal your granite every 6 months to a year. The company you purchase your granite countertops in Edmonton from can provide a manufacturers sealant and instructions on how to use it. It’s generally a simple process: just wipe it on and wipe it off again. You can also purchase stone impregnators and cleaners for your countertops, but using regular soap and water is fine. Be careful not use harsh chemicals, glass or vinegar-based products on your granite. Learn more about sealing granite countertops. Will granite countertops scratch easily? While it’s not recommended, you could cut right on your granite countertop without scratching it. You should still use a cutting board when preparing meals to be safe, but regular use of the countertop will not scratch or damage the finish. Ask Edmonton granite companies about a granite that is more scratch resistant if you are concerned. If you don’t stand on your countertop or drop very heavy objects on it, it should never crack. Experienced granite countertop companies will ensure your granite is properly installed and that there are no flaws in the countertop itself. Will granite burn under hot pots and pans? No! Granite is heat resistant, which is one of the best features of this high-end countertop option. Put your hot pots and pans right on the countertop surface without any worry. It won’t burn or dull the finish. Want more information? Read more articles about granite countertops.